I am really glad to see DNA testing being used to solve property crimes, even if victims have to wait a little while to see justice. I’ve been a theft and burglary victim several times, and when I asked if fingerprints were going to be taken, the cops making the reports just looked at me like I had an arm growing out of my forehead. 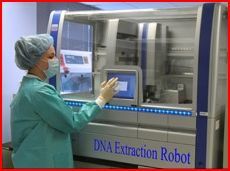 One suggestion, criminals who are caught and convicted because of DNA processed at the crime lab should be sued for the cost of examining their DNA, then served with writs of execution. Take their TV’s, their cars, clothes, whatever else they may have and sell those things to pay for the cost of catching and prosecuting them.